The Medieval age stretched out for a period of nearly a millennium and the culture over an entire continent. Is there any question why there are so many styles and types of medieval swords to reflect that age? Swords evolved from the use of daggers and are first in prominent use around 1600 BC. Through the years most were made by hammering into a strong weapon rather than heating and the main metals used were bronze and iron. These could bend but remained strong enough to utilize as a weapon. The advances in blacksmithing covered a metal progression as better techniques proved that certain materials were stronger bonded together than the bronze and iron that opened the era, ending with steel blades mounted on solid grips with hafts of various weights depending on the use. The shape of the sword also changed because warfare changed. A cavalry rider needed a completely different weapon than a foot soldier and a 17th century gentleman needed a lightweight fast sword that could be worn at all times while a Viking needed something heavy and double bladed to push and hack through enemy lines. But whatever period or country you focused on, the sword remained the first weapon of most fighting men who were not archers or crossbowmen. Even giant swords were available for those who preferred to swing a two handed weapon and these could be used to crush, push, as well as thrust through enemy opponents. Early Medieval swords differed from later ones being made of such as bronze and iron rather than steel. Steel is a combination of alloys and was discovered by several cultures when they lived in regions that had good supplies of the various ores needed. Between 1300 to 1500 A.D., many groundbreaking styles were invented with the use of steel, including the great swords, which chief among these, is the longsword. These two handed swords were massive; some as long as seven feet, while the average was around five feet. They were good for pushing aside pole arms, a common European weapon during that era and had excellent thrusting and cutting abilities. One of the most famous of these swords today, thanks to Hollywood’s portrayal, is called the William Wallace Sword. Many later era statues portray him with a large weapon but the sword that now bears his name may not have been anything like what he used in the battles of 1297 and 1298, which brought him to history’s attention. 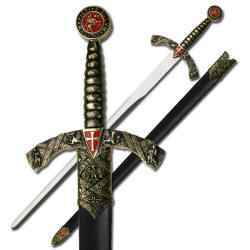 Many swords now available in our present time are actual copies of swords from the period of the Medieval times and have been given names in modern times. The swords that have become famous are swords that remained in the families, mostly of royalty but some are the swords of legends such as King Arthur which are purely modern inventions, yet, like the William Wallace sword, are now easily recognized by those who know their swords these days. Many of these swords are popular with Medieval re-enactors who use them not only for wear with leather sheaths but also for the actual reenactments of famous Medieval battles and tournaments. William Shakespeare 1592; dialogue written for King Richard III in the play by the same name. Check out the Bargain Dungeon !